The January project for Another Year of Schnibbles (AYOS), hosted by Sinta and Sherri, is to pick your favorite Schnibbles. I couldn't pick a favorite, but one of my Schnibbles is a favorite of yours. 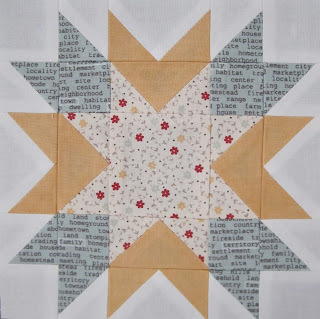 I get more questions on this quilt, the post where I blogged about "One Star Two Star, Red Star Blue Star" is in the top 10 for most traffic on my blog, and it did not include a giveaway! How could I argue with that. This is Lifetime Quilt Number 51, click here for more detail. This quilt was made from the pattern Cindy Lou Who, I've yet to meet a Cindy I didn't like. Thanks Sinta and Sherri for hosting AYOS, May can't come soon enough! Remember this quilt, . . . . I started this quilt in December but refused to finish it because it wasn't my 100th quilt. 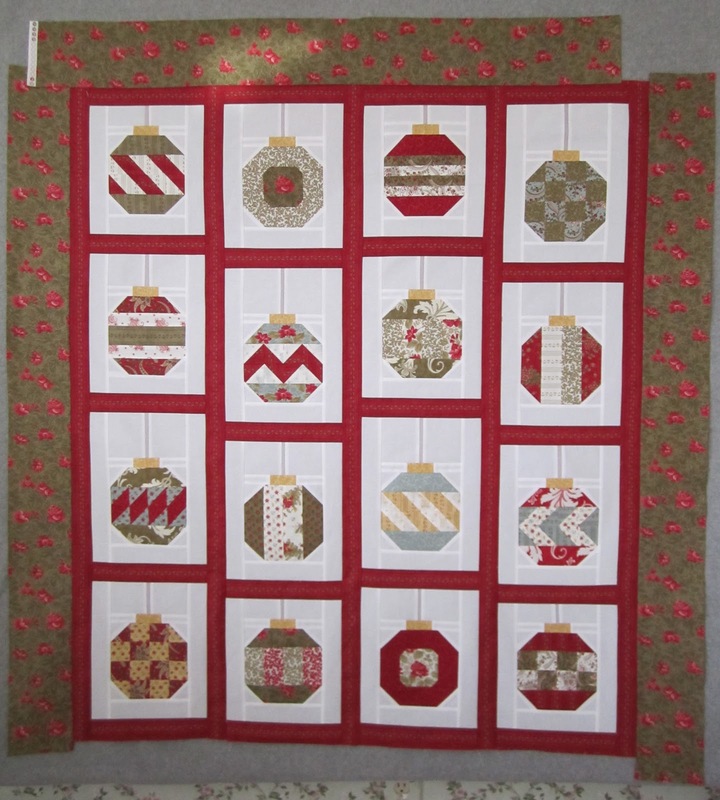 Between all the things that we all do to get ready for Christmas, whenever I could squeeze in the time I happily made ornament blocks in my sewing room. 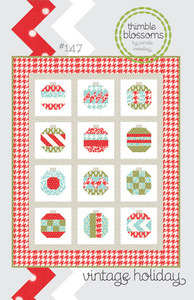 The pattern I used is "vintage holiday" by Camille Roskelley for thimble blossoms. As I sometimes do, I changed Camille's pattern just a tad, I made my blocks smaller, made more blocks, and "hung" them from the sashing. After days of feeling frustrated with where my other 100th quilt project was going, I decided to put a border on this quilt. After sewing the sides of the border to my top, I decided I didn't like that fabric, I think the print is too small for the center. 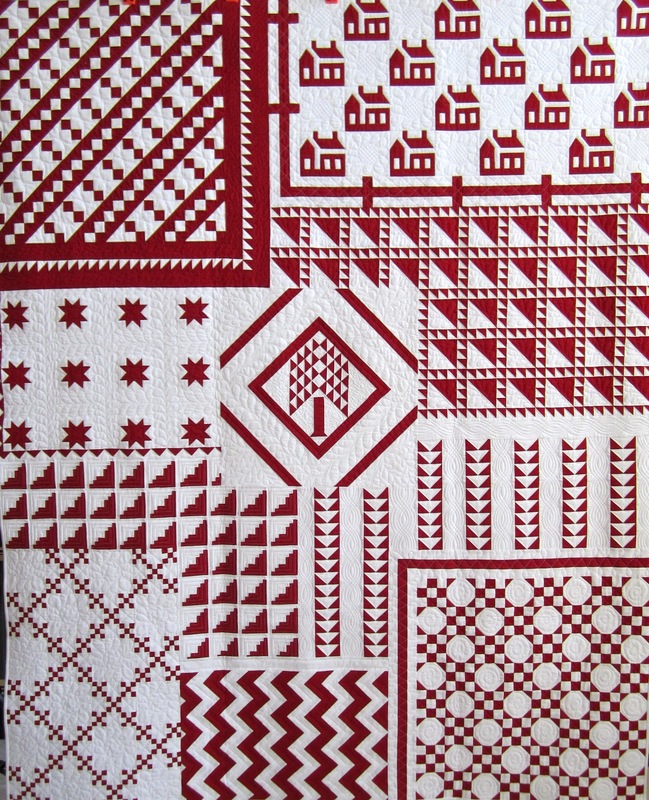 So here's another fabric from the line, Roman Holiday, it is a bigger print and looks nice I think. The problem was that I only had two strips of this fabric and couldn't find anymore. After looking at this on my design wall for a day or two, I decided the print was a nice size but still a distraction. So I cut the border in half and got this, just the perfect little border to finish off this quilt. This is Lifetime Quilt Number 100! Boy does it feel good to say that. 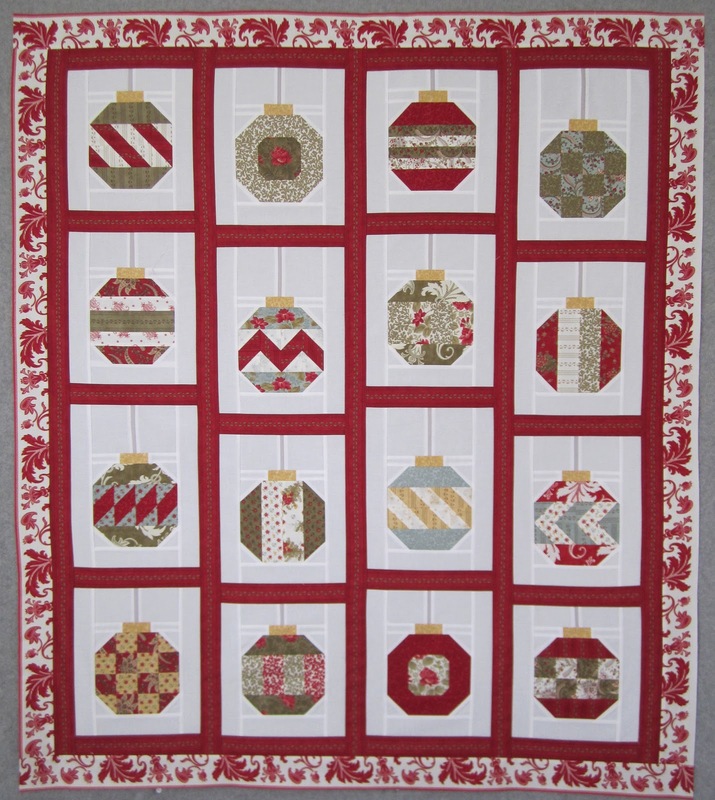 After spending months and months of collecting blocks, drawing blocks, and trying to come up with a pattern to exceed all the unrealistic expectations I had created in my head, and making my sewing life stressful and myself miserable, it dawned on me that this Christmas Quilt was me and what I do, and the perfect quilt to be my 100th quilt. This quilt has red, I changed the pattern to suit myself, and I love it, what more could I ask for from a quilt. This quilt finished at 48" x 55". The pattern is "vintage holiday" by Camille Rosekelley for thimble blossoms. It has approximately 418 pieces. After spending (wasting) so much time on the perfect pattern for quilt 100 I'm at a loss as to what start next. I usually have my next 6 quilt projects lined up, but I'm guessing now that this quilt is done everything will fall into place. "To market to market to buy a fat hog, home again home again jiggity jog" . . . . . I had the best time in California, thanks so much for all your best wishes. The temperature alone was worth the trip, highs in the 70s, lows in the 50s. And while I did enjoy the weather, spending time with friends, shopping, and attending the Road to California quilt show were all highlights of my week. Here are a few pictures from the quilt show, I always get distracted and either take horrible pictures or no pictures, there's just too much going on for me to focus on photography. This is the "Best of Show" quilt. "Red Feathers" was pieced by Claudia Clark Myers and quilted by Marilyn Badger. My photo doesn't come close to doing this quilt justice, it is a winner. This is "Never say Never" pieced by Laura Fraga. It's a Dear Jane quilt made using just two fabrics, background fabric and one print, I think it's a Kaffe Fassett print. 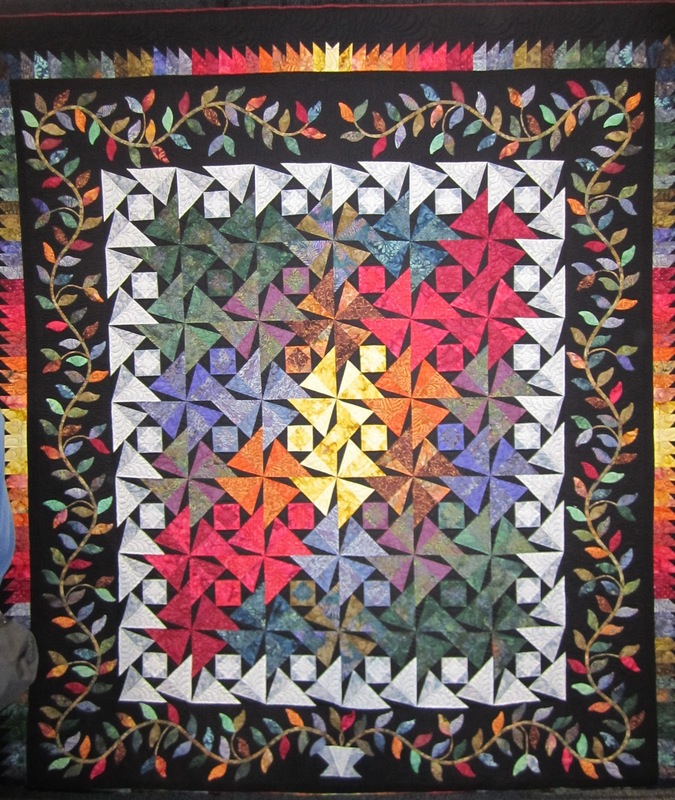 This quilt didn't place at this show, but it's a winner and has placed in other shows. 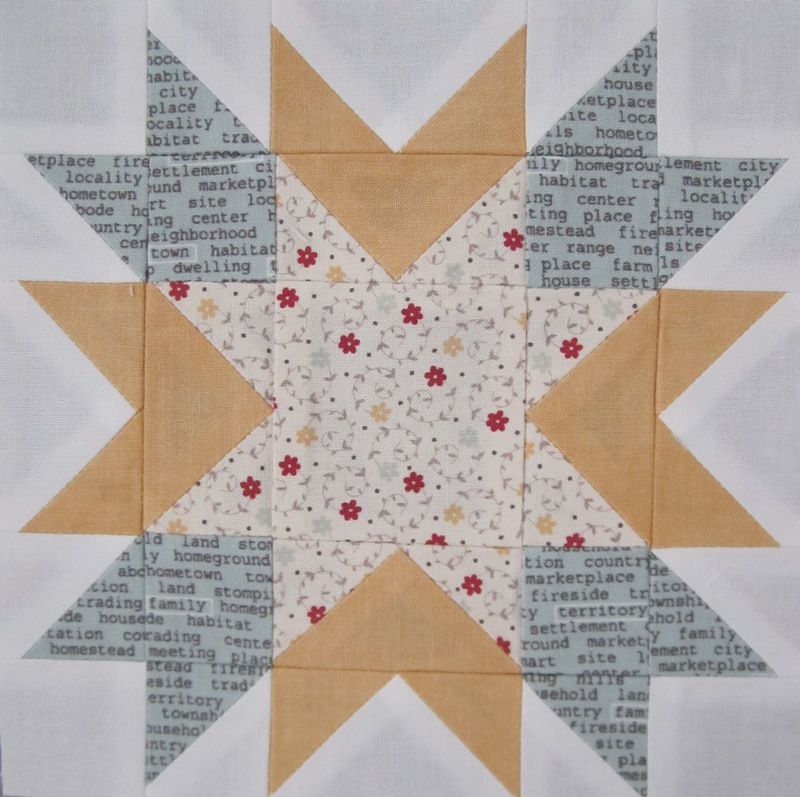 I think this is my all time favorite Dear Jane quilt, great job Laura! 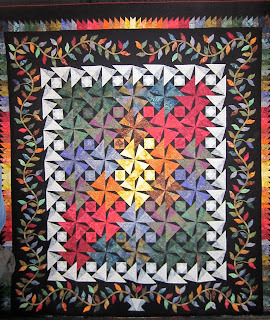 This is Green Miles, pieced and quilted by Peggy Kragnes. I think this quilt was my favorite, the colors, the use of black and white, the borders, all of it, amazing and inspirational. 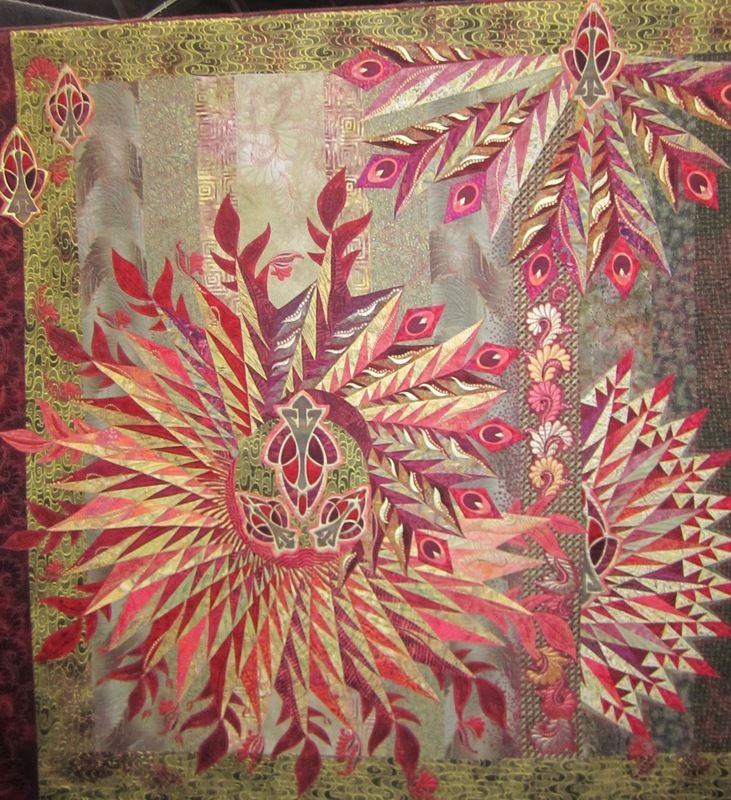 I've got to put a leafy viney border on one of my quilts. 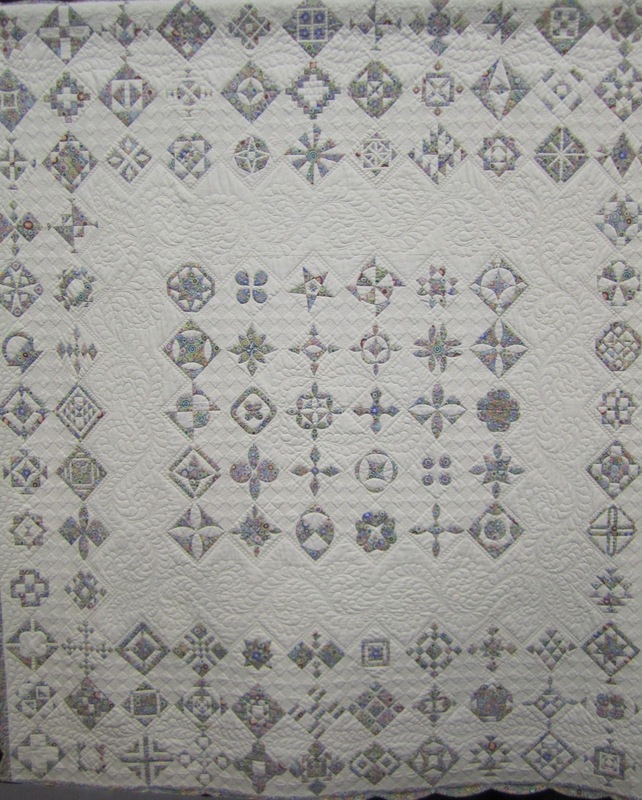 This was pieced and quilted by Patricia C Robertson. 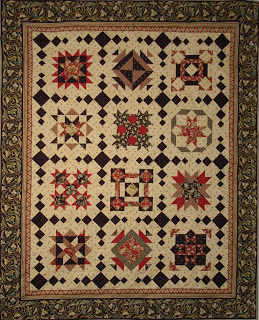 My Star Quilt, "Two Score and Seven Stars" took third in its division, what an honor. My first stop was the Primitive Gatherings booth. I picked up these packages of 5 inch squares. I can hardly wait to use them in a new Schnibbles or Little Bites pattern or maybe use them in a little block of my own. Their appeal to me was to get a scrappy mix of charms without having to take a "bite" out of a fat quarter. I also bought a kit for these two quilts, Miniature Bride and Flower Girl. This is available on the Primitive Gatherings online shop, here's a link. 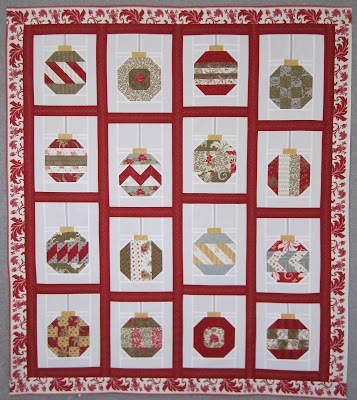 And finally, I bought this little kit, "Bow Ties and Spools"
I bought this kit from The Calico Horse booth, this is a "My Red Door Designs". 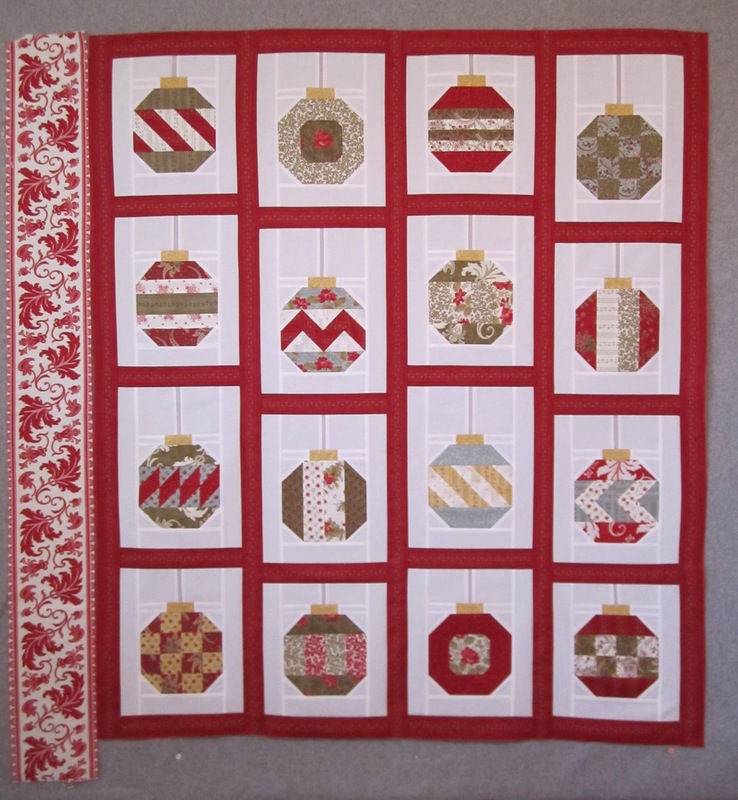 The bow tie quilt finishes at 13" x 15" and the spools quilt finishes at "17 x 17". I was not familiar with The Calico Horse, here's a link to their shop, they have several great things. A few other folks attended the Road to California show and did a better job of picture taking and shopping than I did, check out Vicky, LA Quilter or Sweet P Quilting for more show details. So I'm back home with nothing to do but sew, I just LOVE this time of year! I'm leaving the family behind and meeting up with some friends for a week of sewing, shopping and fun in California. There should be a 50 degree difference in the temperature from where I live to where I'm going, that alone is worth the trip. I've got my sewing machine all packed and ready to go. 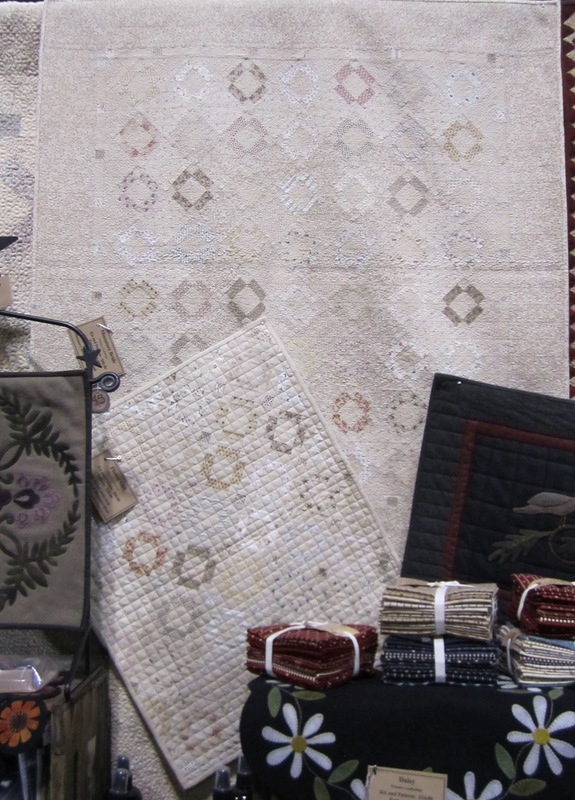 While in California I also plan to attend the Road to California Quilt Show. 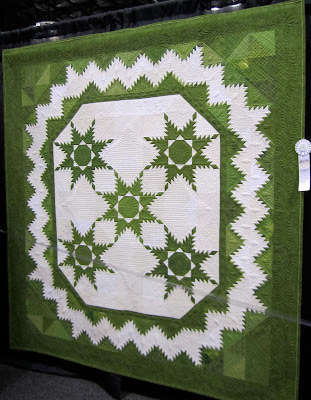 quilted by Judi Madsen, aka The Green Fairy. quilted by Connie Lancaster at Quilts Plus in Indiapolis, IN. This is the end of the road as far as shows go for these quilts, once they're back home they'll be on a bed or on a quilt rack with the rest of my quilts. I'm as confused as most of you as to where to go next with my 100th quilt project, it's not shaping up at all like I thought, a break will do me good. No blogging for me the rest of this week, but I'm sure I'll have a lot to talk about next week! That's a quote from Bill Blass. Did you know Elizabeth Taylor loved red? The one thing we have in common, oh there is that diamond thing, who doesn't love a good diamond or two, but I'm not in Elizabeth Taylor's league when it comes to diamonds, but I digress, as usual, this post is about red. 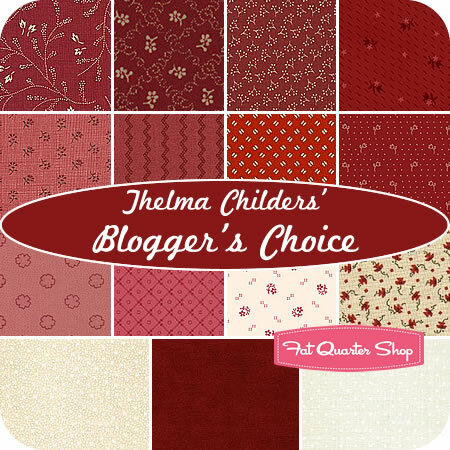 Last fall, Kimberly at the Fat Quarter Shop asked me if I would be interested in creating a Blogger's Choice fabric bundle. Sounded like fun to me, who wouldn't want to create their own bundle of fabric? I thought I had it made whenI saw this fabric, Sweetcakes, by Doodle Bug Designs for Riley Blake. 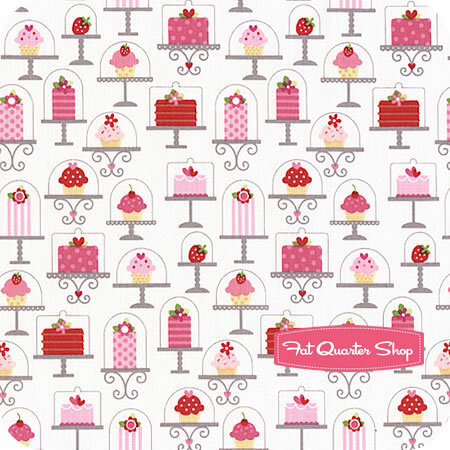 Have you ever seen a more perfect fabric for someone like me, who loves red AND cupcakes!! All I needed was a few pinks, reds and grays, maybe something with some dots, and I would be done with my perfect little bundle. So on to plan B, and here's what I came up with. My bundle is available in February, so between my love of red, and February being the month for red, I decided to put together a red and cream bundle that would work for any month and a variety of projects. I've yet to see the actual bundle, I selected all my fabric off of swatches from my computer. I hope they look as nice in person as they do online. This pattern is made using 75 charm squares, I'm guessing you could easily get 75 5 inch squares from 11 fat quarter bundles. How about Scarlet Letter by Sew Unique Creations? 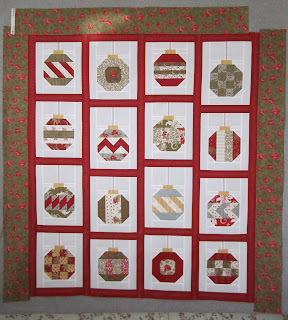 My bundle would get you over halfway through the center of this pattern, it calls for 1/4 yard cuts of 8 red fabrics. 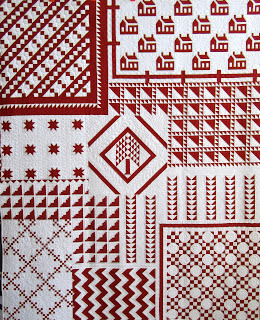 Here's a quilt on my To Do list that would be a good use of those reds, Scarlett Queen by Carrie Nelson for Miss Rosie's Quilt Co. 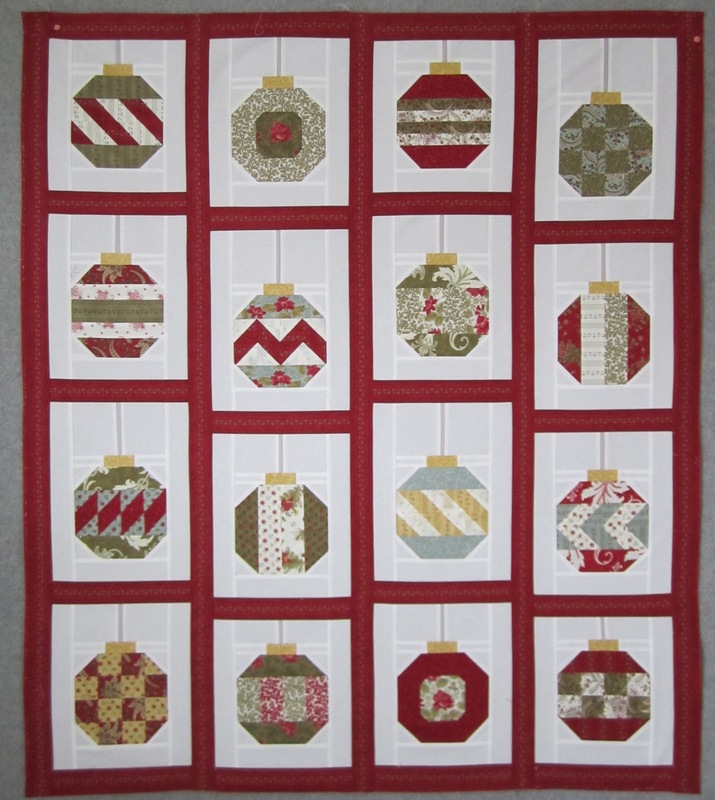 This pattern needs 18 red fat quarters, so you would need to add 7 fat quarters from your stash to have enough reds. 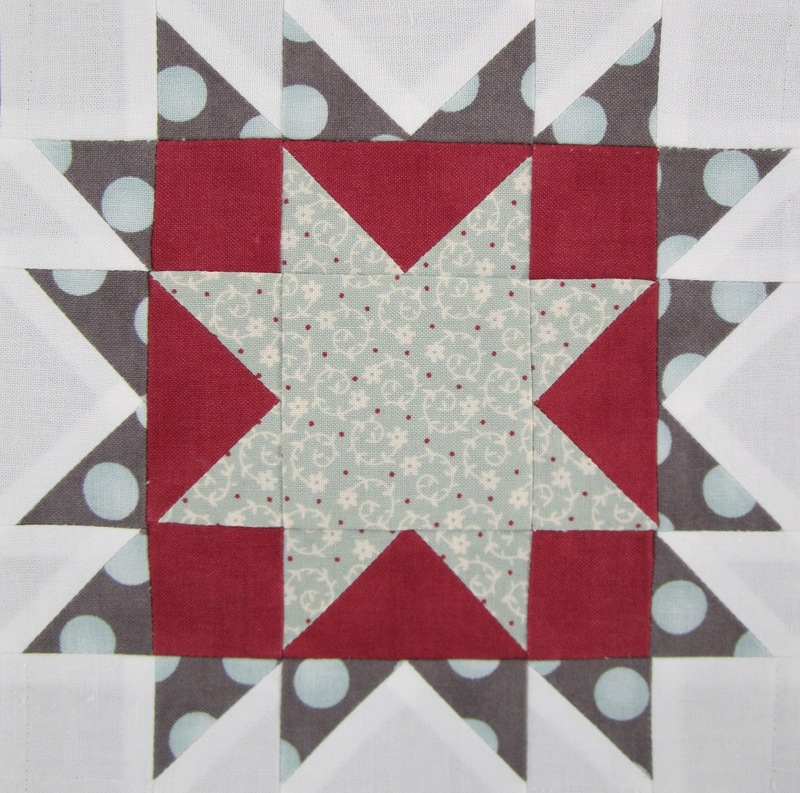 This pattern is also on my To Do list and another reason why I need some reds, Madder Stars from the Elegant Quilts, Country Charm book by Leonie Batemn and Deirdre Bond-Abel. 11 fat quarters from my bundle doesn't come close to making this top, but it's a good start. Finally, here's the project I intend to make with my bundle, Chip. It finishes at 36" x 36" and needs 80 2 1/2" squares. 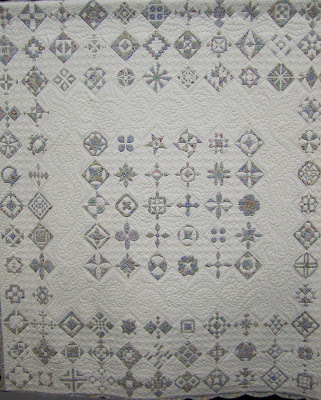 This is a smaller version of Hubble/Hubbel, my Lifetime Quilt Number 91. 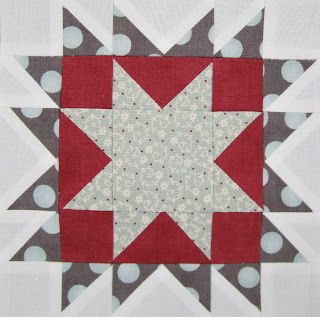 The whole time I was making that quilt I kept thinking, "this pattern would make a wonderful red and white quilt". Now I'm going to give it a shot. If you would like more information about the Bloggers Choice bundle or be notified by the Fat Quarter Shop when it's available click here. Maybe this would be the perfect little somethin' somethin' to put on your list for Valentines Day, it's not chocolate, but maybe it would last longer and look better on you than chocolate! I think I've come up with a plan for my 100th quilt. I've known ever since this quilt was on my radar that I wanted to create my own pattern for my 100th quilt. Most of the ideas I played around with were for a medallion quilt using different blocks surrounding some sort of center. 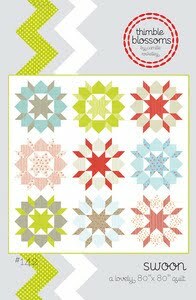 I'm still going with my medallion quilt idea but I've decided to go with a one block quilt. I think out of my first 99 quilts I have less than 10 one block quilts. I usually get bored half way through a one block quilt, but I have a few ideas that will make this one block quilt a little different and fun, I hope. Here are the pieces for that one bock, and these are the pieces for my center. I'm feeling pretty good about my latest idea because I have a plan, if I don't like this quilt I won't finish it, then it won't be my 100th quilt! Let's hope I do like my latest idea and that I don't drag out this 100th quilt thing all year long. Several folks ask me how I knew how much fabric to buy for my project since I didn't even have a pattern. I'm starting with a fat quarter bundle and a layer cake of two French General families, Rouenneries Deux and Chateau Rouge and I know my quilt is going to be scrappy. But if I need any additional fabric I feel confident that I can track some down or even use something from a new French General line, they all seem to go together. 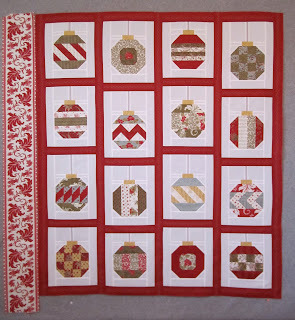 I think you could do this with other families of fabric too, like Fig Tree fabric and Bonnie and Camille's fabric. My background fabric is from the Rouenneries Deux by French General for Moda family. The front of the fabric is just a shade darker than the back of the fabric. When the sun is shining brightly, the difference between the front and the back is obvious, but if it's a gray day, like most days in January where I live are, it's easy to get it wrong. After resewing my third piece I made this little "cheat sheet". I have these two pieces of fabric laying right next to my sewing machine under my Ott light. Before I run any pieces through my sewing machine I'm checking the background fabric against these. To make it even more mindless I even marked them, "F" for front, "B" for back! I've not had to resew any pieces since I came up with this method. I'm a little behind on my email and blogs, my husband and I took a trip last week to celebrate our 36th wedding anniversary. I have no idea what I was thinking getting married the first of January, after all the holidays the last thing I'm usually wanting to do is plan another holiday, but the change of pace and weather were nice, I'm glad we celebrated but happy to be home. My Christmas decorations are down, but not packed or put up, oh well. I thought it would be fun to see if you could guess the one block I'm using for my 100th quilt. Leave a comment with your best guess and I'll put all the correct guesses in a drawing for a pattern of your choice from the Fat Quarter Shop. The block goes by different names and I'll accept them all. 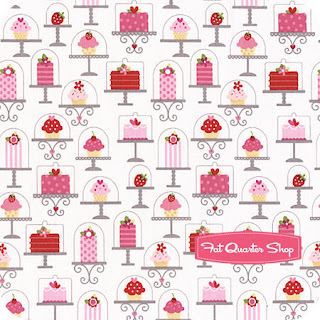 If the Fat Quarter Shop will ship to your address you're eligible to enter. I"ll give you all week to think about it. It feels so good to have nothing on my radar but sewing, the holidays are great, but there's something to be said for weeks calm and quiet, I plan to make the most of mine. I've made a fabric decision for my 100th quilt, I think. Chateau Rouge and Rouenneries Deux by French General for Moda have the look and feel I'm hoping to go for. I think that yellow/maze color in Chateau Rouge will be a nice change of pace and give me a little different look from the red and gray quilts I've made in the past, I hope. Here's hoping I'm very virtuous this week! "You create your own suffering", do I ever.